Why is it that no review sites are doing a proper review of the 790GX motherboards? Maybe in particular finding out about hybrid crossfire, the DFI LanParty JR 790GX-M2RS which has crossfire on an mATX board. But at LEAST follow up your preview with a full review! Some of us stupid AMD fanbois have had precious little good news in the CPU and chipset department and the 750 southbridge might just have something interesting to offer! I want testing!!! GIVE ME REVIEWS!!! An update, DFI decided to proceed forward with their uATX 790GX board. My retail kit arrived today and I will be testing it shortly. Also, based on your comments and others I will show a 4870x2 vs 4870 CF on this platform and compare it to 790FX. The roundup should be up late next week, G45 is up on Monday with 790GX/780G/GF8300/NF750a comparison results. Perhaps we are waiting for Intel to see AMD. Updated BIOS and Drivers will be part of this article. Now we have time line. 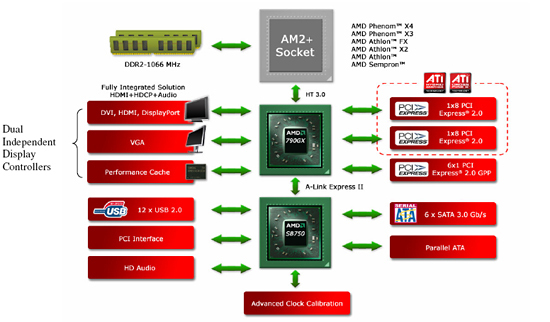 It has been since August 6 since AnandTech first published an article on 790GX/SB750 from AMD. Certain remarks have been made about the products and the proof has been promised, but not delivered. This is the second time in a row this has been done to an AMD motherboard chipset. Trust is built on promises delivered. AnandTech is not delivering and is not saying why.